Tie Fighter - Not memorabilia and yes it can fly! Blogs Mentioned in prior posts. I wish I had my photos from Last years Orlando's Mini Maker's faire. I stole a couple from friends to post here. Last year was the first one in Orlando and it was a huge hit. I've always been a fan of the things people make and those that know my husband know he's always making something. So naturally this place was like coming home. Palm Beach LED describes the Maker's faire the best, "Celebrating Central Florida’s Innovation, Invention, and DIY spirit! This Mini Maker Faire is a community-organized celebration featuring local DIY science and technology, rockets, robots, arts, crafts, and music." This year the faire is being held at the Orlando Science Center on October 5th. You can get your tickets here or at the door. This year they've been holding mini maker's faires for the past couple of months building up to the main event. One of these events was Robot Days. This was really a lot of fun. Although everything that was most impressive I was really quite surprised by the kids who built robots and made them run. These brilliant kids were enthusiastic to show & explain what their robots could do. So what to expect from the main event? Well last year I wasn't sure what to expect. I'd seen tons of photos about the maker faires on the west coast, but being a new event here in Orlando my largest fear was it would be a flop. Never have I been happier that my biggest fear didn't occur. With over 100 exhibits and 2500 attendees, it was a major success. While looking over the site's list I can't wait to see the rockets, learn what a theremin is, learn about the Dark Sky Festival, what hacker spaces are used for, Special effects make-up workshop, Lock pick Village, Steampunk creations and assorted 3D printers, just to name a few. By the way fellow makers I plan to bring a box of misc stuff for other makers to have that I don't want or need. Can't wait to see what people make. Last year we attended the first Orlando Maker’s faire. It was a real blast. You had all kinds of electronics, art, music, projects.... I could go on & on over the things I saw. This year Maker’s Faire will be at the Orlando Science Center on October 5th. The faire is included with the regular Science Center’s admission ticket. As a lead up to the main event the Science Center has been hosting Mini Maker Days. This weekend August 10th is Robot Days. So of course there will be several R2D2’s and other Astromechs there. So in anticipation of the event I felt like focusing on robots. They are so fascinating on so many levels. I love how people express this interest in robots such as art work. In art it’s limitless like artists Robot Envy, Rusty Robots and Robots are Awesome. Each Artist is unique. Robot Envy’s artwork has such a variety as the real robots of today. Some look retro while others look new age or even charismatic. Rusty Robots by Space Cow Smith are nightly. Robots are Awesome, is fun loving, quirky and brings a smile to your face. It’s funny how something mechanical almost feels human. But the obsession with robots doesn't stop there. It’s hard to believe that the fascination with robots goes back to the 1700’s. These first early robots were called automatons. Some of these early creations are intricate that the engineering involved with some of them have been lost over the years. It’s hard to believe that their creation is due to watchmakers trying to show off their skills. Some are so intricate they could not only right & draw they could perform and juggle. It’s amazing to believe that such creations existed so long ago. At the time of their creation these early robots were a status symbol of high society. I’ll include a couple of links to these early robots. Some are so life like. Today’s robots are nothing like what we pictured but they are coming along. Sure we have robots that can do a sketch of someone but it’s amazing what we are able to do with the robots of today. Just recently in the news this past week has been about robots to assist astronauts, Surgeons and even explore for us in areas we can’t go. All in all I think what most people find fascinating is that they work and how. Many of us don’t think we are capable of building a robot till we actually meet someone who has built one. Sure it can be as simple as a Rolling MP3 player with arms or a childs toy that can talk think and move on it’s own. The possibilities are endless. I think of all the things robots have inspired I hope to see what people create & bring to Robot Days and what inspirations will occur from this event. Hope to see you there and please feel free to say Hi! As promised here are some links on automatons and some other robot news you might find interesting. Tay Sach’s Disease: Quest for a Cure. For such a small droid R2 has such a large heart. Kind of like Bruce Wayne in Batman people think he’s just loves to party and go to conventions. Like so many other droids he brings hope to those in need. So last Friday, April 1st, Todd got a flier about a Spaghetti Dinner fundraiser for Kaleb’s Cure and offered to bring R2. I’d like to thank Fountain Automall for sharing the flyer to it’s employees as Tom Kaleb ‘s grandfather works for them. So if your in the Orlando/Winter Garden Florida area please come by. For more info you can visit them on Facebook or the site about The Ogden Family. Let me forewarn you that you really need a box of tissues next to you when you start reading about this disease. My heart goes out to Kaleb and The Ogden family. Some refer to Tay-Sachs as a Jewish disease and as such I’ve heard of the disease but never really knew anything about it. I grew up always thinking that only descendants of Ashkenazi Jews are at risk but I was wrong. Granted it’s a rare disease and only about 16 case are diagnosed a year in the US but you’d be surprised. Granted the highest risk group is Ashkenazi Jews, French Canadians and Louisiana Cajuns. But 1 in 250 from the general population carry the gene. That is kind of frightening. Well, now that I have your attention, what is the disease? It’s a rare genetic Lipid storage disorder. So what does that mean? Well, Fatty waste products build up in the brain cells causing them to swell and die. Sadly symptoms do not start to show till about 6-7months old. There is no cure for it. It is always fatal and sadly children diagnosed with the disease rarely live to see their 4th birthday. Sadly because it is a genetic disease associated with a particular ethnic background it gets misdiagnosed. There are tests that can be done to find out if you are a carrier as well as prenatal tests for the fetus. Just remember even if you are diagnosed as a carrier doesn’t mean you can’t have children. Even if both parents are carriers there is only a 25% chance of the child getting Tay-Sachs. Much isn’t known about the disease and there appears to be other variations of the disease. So I do hope that we see you Saturday at 271 West Plant St in Winter Garden but, even if you are unable to go there are many other ways you can help even if it is not much. If you use Facebook you can watch videos where watching the video earns money for the cause. You can also donate via paypal to help with Kaleb’s medical epenses or donating at one of the charities listed there. How to be a relationship JEDI! I know it's weird of me to say but most churches creep me out. Not sure why I've only had 1 bad experience at a church. So believe me when I say that the event we did last night at Journey Christian Church was a blast! And I wasn't creeped out at all! Now normally I guess one should find out more about a place before they do an event but I have to admit I had no clue about Journey and must admit that they are not what I would have expected. The name of the event was, "How to be a relationship JEDI". It's part of their youth program called Reverb. Although we didn't go into the auditorium during the meeting it was fun to hear the kids inside be all excited. I believe it was either Amie or Matt that told me that it was about building relationships and that tonights meeting was about serving others. I can't help but say that is a tough stance for a church to take. Although Aime said it best when she said, "that doing the right thing is not always easy". In today's society you see so many of our youth throw their lives away with wreckless decisions. Not to mention so many parents are to busy to be parents and talk to their children about building relationships. Although I don't have children of my own I've met so many wonderful kids over the years and have to admit that it breaks my heart when I see them going for a relationship that B9, from lost in space would scream, "Danger!". So if you live in the Orlando area and are looking for a church that has family values on their agenda I highly recommend checking them out. I also have to say I really enjoyed my conversation with Aime and learned from her and the many inquisitive children what a great place this was. I also have to admit I really enjoyed watching the videos they've done on relationships. I have to say one of my favorite parts of the night was when I took R7's head off. I remember as a child how being smart and being intrigued about science and electronics was frowned on by my peers. So I really got a kick out of the swarm of kids and adult who came over to look. For more information on Journey Christian Church you can check out their main site or find them on Facebook. For more info on their youth program Reverb you can visit their main site or find them on Facebook as well. As a side note I'd like to say it's always a pleasure to work with the 501st! I'd also like to thank Jim Quinlan for let Matt know about the group here in FL. Thanks so much Matt for having us it was a blast. If you guys ever have a need for us just ask. Also want to say thanks to all the kids for being so well behaved. You make your parents proud. Many people know R2 when they see him but few know that he's more than just some famous droid from Star Wars. Many don't know about all the great things he does when he's not busy hang out with fans at the many conventions held around the world. 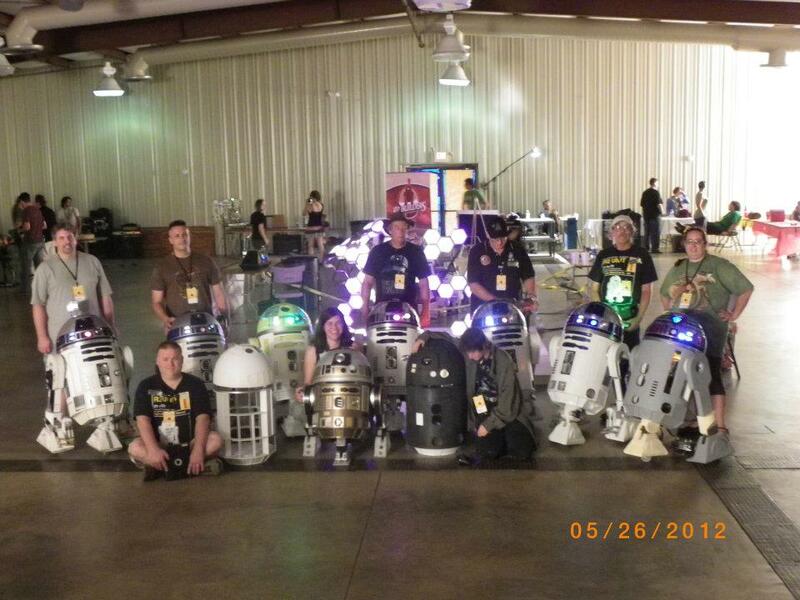 Recently another individual who owns an R2-D2 made an egotistical comment about how they built their droid for charity purposes and invited an R2 Builder to join them or do charity events too. Well, it's been a few days since I read those comments and it infuriated me beyond belief. Especially since not only does that individual do a lot of charity events with their droid but so do so many other R2 builders. I know you guys don't go boasting about your accomplishments and how awesome you are for doing events for this charity or that but I felt that you guys deserve recognition. The video above of Victor Franco's build of his R2 shows tons of charity events that he's attended with R2. We all know how wordy I get when I go on a tangent but I decided to see what I could find as to what the droids have been up to. There are so many stories of how droids will ruin our lives and take over the worlds but with so many kind and caring droids like R2-KT it's hard to think that machines will bring our doom. In the long run I think it's their compassion to inspire and bring joy to the lives of children and adults that will help us live a better life. It's saying something when even a toy company is compelled to make an action figure of this much beloved droid. Oh and who can forget about when Paul accompanied R2 at the Eastern Maine Medical Center in Bangor. They say that laughter makes you live longer as well as there is no better medicine for sick children than the laughter and smiles that come from seeing a "real live R2 unit". Paul has accompanied R2 on many other similar benefits and just viewing the laughter and smiles on Paul's blog from these events is so heart warming one heart might burst! Now granted all these stories were mostly in the US but I have 1 more I'd like to mention that is from the United Kingdom. Mark Enwright's statement in an interview with the BBC about sums up the best part of building the droids. He said, "Building these kinds of robots is very self-indulgent, so getting the opportunity to raise money for charities using these builds is very satisfying". Mark you are so right! The convention was a blast I had so much fun! To bad gas prices sky rocketed that week. The convention took place at (MACC) Miami Airport Convention Center. I don't know if Megacon does a red carpet event but I thought it was a cute idea. Especially since everyone waiting to get in gets to see the stars, cosplay and fan groups as well. I think it gives them a taste of what they can find inside. I really loved Urban Ronin's Stunt Team's red carpet entrance. Granted they almost ran me over but I think that's what made it so much more fun. There's nothing like a good front seat to fight. One of the other things I liked about the red carpet entrance was the boys got to go out there with their droids. I think we were a big hit not just on the carpet but on the floor as well. I probably say this all the time but there is nothing like seeing kids & kids with 18 yrs or more experience face's light up at the site of the droids. Each one of our droids was different and had their own thing. I know one thing none of us will forget is this cute girl from the picture on the left. That girl was so cute and loved the droids so much. She couldn't believe their were 2 R2-D2's. When she did the Leia scene everyone had to take pictures of her. I don't think Todd will ever forget her reaction the first time he played the Leia message for her. Her eyes got as big as saucers, clenched her hands to each side of her face with a look of amazement. I also don't think either of us will forget Brimstone and the Borderhounds comic book. They signed it and gave it to R2. There is a picture of it on Paulina Splechta's Photography blog. I don't think Mark will forget all the kids dancing to his and Fletch's R2-D2's Cantina song. People ooh'd and aah'd over Blake's R2-X2. They really enjoy being able to see the inner workings of the droid. Mark and I were both amazed at how many kids knew the different droids. I thought it was a great idea of Mark to have brought photo from Celebration V. It was a major hit. Can you believe people are still talking about Miyamoto's R2. One of my favorite parts of the convention was that people thought it was cool that my R7 played other songs besides Astromech sounds. Although the absolute best part was getting a hug from Ernie Hudson. It's nice to meet people who are really nice. My worst moment at the con was being told my droid was the gay droid because of an upside down purple triangle. Grrr it just irritated me. No offense but what happen to the earing thing or rainbows? Although that is silly cause I like rainbows too! I did feel a little bad about being agitated by the comment but oh well. Best complement we received was from one of the vendors. They said that the droids really made the convention a lot of fun. A lot of the vendors will also be at Megacon so they are now looking forward to that even more. Some lessons I've learned not just from this convention but other conventions I've done is make sure your foot motors are on a separate switch. We did have an incident where the throttle on their droid's foot motors was not in the neutral position and took off and hit my droid. No damage done and I was glad it was my droid who isn't finished instead of one of the guys. Another important lesson is to have relays for your foot motors so you don't blow the speed control. My only regret is that the main Astromech.net site is down. Luckily we have a local forum cause apparently there is a demand for builders in Miami. Some even stated the only reason they didn't start was cause they didn't know of any others in that area. Sadly it does seem we are lacking builders in southern Florida and well, Orlando, Tampa and Brandon are all long trips from Miami. Any way if you missed out on going or want to see more pictures here's some links and videos that were not previously mentioned. Had a blast taking R7 to the coin show. Next stop Wizard Con! Ok so here's some info on the event and look forward to seeing you guys there. I promise to attempt to try to find time to post more. Besides who needs sleep? I'll get plenty when I'm old and can't do anything. Got a question about building a droid or about my droid just ask.